Electricity was generated for the first time by a nuclear reactor on December 20, 1951 at the EBR-I experimental station near Arco, Idaho, which initially produced about 100 kW. Even before the serious possibility of nuclear weapons was considered, scientists were intrigued by the idea of nuclear power. Einstein's famous E=MC2 equation indicated that huge amounts of energy were contained within even the smallest amounts of matter. The numbers are really quite staggering. As was mentioned in the previous section, a pound of uranium has as much energy as 3,000,000 tons of coal. Looked at in terms of energy production, rather than destructive force, 1 kt of energy is equal to 1,160,000 kilowatt hours. Think about how much energy that is --- over a million kilowatt hours. So how much fissionable material is required to produce this energy? Only 57 grams (around 2 ounces) of material must be fissioned to produce either a 1 kt explosion, or a bit over a million kilowatt hours of energy. Even assuming great inefficiencies, there is still a tremendous amount of energy to be harnessed from nuclear sources. In the standard nuclear power plant, a fissionable (usually enriched uranium) is allowed to "burn" by fissioning slowly. This produces quite a bit of heat, which is used to create steam to turn turbines. In every way, this is identical to the functioning of a standard coal or oil powered plant, except for the nature of the source of heat. Because of the possible radiation danger, nuclear heat sources must be treated rather carefully. So the basic principle of nuclear power is simplicity itself. Get a big enough lump of fissionable material together and it will get hot --- very hot. Using this as a source of heat, water may be boiled into steam, and sent on its way to the turbines. Unfortunately, as the old saying goes, the devil is in the details. When you burn normal fuels, such as coal or gasoline, you get smoke and ash. The more completely you burn these fuels, the less smoke, and the less ash that is produced. When you "burn" nuclear fuels, you get radiation, and nuclear waste. The more efficiently you burn nuclear fuel, the less nuclear waste you have. In both cases, the more efficient the combustion, the more dangerous. A lean burning combustion engine is more efficient, can create more power on less gas, and produces a cleaner exhaust than a richer burning engine; but lean burning engines create more heat, and are harder on their components than richer burning engines. In the case of nuclear reactors, a more efficient reactor will create more power, create less nuclear waste, and need to be refueled less often. It will also create more radiation, while it operates. In both cases, the residue is unwanted, and must be disposed of somehow. This is particularly the case with the common slow reactor. The typical power reactor is called a slow, thermal, or moderated reactor. All three descriptions are accurate, describing the way that neutrons are managed during reactions. There are two ways that a neutron might react with a nucleus. It can smash into it, breaking it apart, or it can join with it, making it larger. The former is best accomplished by fast neutrons, while the latter is better done by slow neutrons. A neutron splitting off from the nucleus of an atom, has a considerable amount of speed and energy. The typical moderated reactor uses a moderator to slow the neutrons down. Though fast reactors do exist, we have decided to go with slow reactors here, because of the perception that they are more manageable, and safer. This perception has come under quite a bit of fire lately; but that is a subject that will be handled a bit further down the page. Moderated reactors are also a bit less fussy about their fuel. The basic slow reactor uses enriched uranium, to about 3% U235 as fuel. This is converted to the oxide, which is a ceramic. The oxide is in the form of pellets, which fill metal tubes, bound together in an assembly, which is combined with other assemblies to make the reactor core. A photo of an assembly is shown below, taken at Argonne National Laboratory. These cores are replenished about every six years, with a third of the core being replaced every two years. This is done using a single convoy of trucks, as opposed to the constant stream of coal trains required for replenishment of a regular coal fired power plant. Interestingly, once the chain reaction gets underway, it is not the U235 which produces most of the energy used; instead it is U236. Note that this only works in a moderated reactor with slow neutrons. What happens is a slow neutron will merge with the U235 nucleus to make U236. The new element is far less stable than U235; but would still be stable enough (U236 has a half life of 23,420,000 years), except that its nucleus will now contain the energy of the recent collision, and hasn't quite settled down yet. This will be just enough disruption, in most cases, to cause the nucleus to immediately split into Ba-141, Kr-92, and three neutrons. If you add up all of the numbers, you will see that they equal 236. Uranium 236 does not exist in nature; but would be part of the thorium 232 decay series, if it did. In point of fact, if left to its own devices, U236 would decay into thorium 232, at a rate dictated by its half life, and that is the problem. U236 is ordinarily stable enough that it does not split, but instead decays slowly, as a part of the thorium 232 decay series. The split into Ba-141, Kr-92, and three neutrons occurs because of the extra energy transferred to the already unstable nucleus, by the striking neutron. In most cases this will cause fission; but for about 18% of the U236 atoms created, the nucleus will remain stable. So for every hundred U235 atoms transmuted, 18 remain as normal U236 atoms, with the normal U236 half life. With a half life of over 23 million years, U236 is about 190 times more radioactive than the U235 from which it is created; but still stable enough to remain around for a long time. In addition to this, U236 is what is known as a neutron poison. This has the contradictory effect of making the original fuel both more radioactive, and less likely to fission, as it burns. Actually, there is some disagreement, as to whether the neutron is fully absorbed, before the nucleus splits. Whatever the exact timing of the process, over the life of the fuel, U236 begins to accumulate, along with other waste products, until the fuel rod becomes so clogged with neutron poisons, that a self sustaining chain reaction is no longer possible. This occurs after only about 3% of the fuel is burned. The first moderated reactors used carbon (actually, graphite), as the moderator. The United States abandoned the use of carbon moderated reactors almost immediately after our nuclear program started, because of the risk involved in this type of reactor. The old Soviet block used, and continues to use, carbon moderated reactors. The United States, and most other nuclear powers, use light water moderated reactors. By light water, what is actually meant is normal water, as opposed the heavy water reactors developed for research. There are advantages and disadvantages to both types. The light water reactors must use enriched uranium, where the amount of U235 is at least 3%. This is about a five fold increase over its natural abundance. This is a very difficult process, due to the fact that chemical separation is impossible. The only way to enrich uranium, is to take advantage of the fact that U238 weights 1.5% more than U235. This is a trivial difference, and the separation process is long, tedious, and expensive. Heavy water reactors use a form of water in which the hydrogen atoms have a neutron, and a proton in their nuclei. In normal water, the hydrogen atoms have only a proton, in their nuclei. The process for making heavy water, particularly in the quantities required for reactor use, is expensive and involved; but the heavy water reactor has one important advantage over the light water reactor. Heavy water is so good at moderating neutrons, without absorbing any, that plain old un-enriched uranium can be burned as a fuel. It might seem to be a matter of six of one, and half dozen of the other, in regard to deciding on which type of reactor to use. It might seem that it would be easier, more efficient, and more certain to just smash an atom apart with neutrons, rather than go through all the trouble of using a moderator; but there are some problems associated with this. First though, for those who have a hard time with the idea of a slower, less energetic neutron being able to accomplish something that can not be done by a faster neutron, or why some nuclei respond better to fast neutrons, and others to slow, here is a real world example. Imagine that you are closing a door. Lets say that the door is a light weight, hollow core door. Such a door has little inertia, and is very susceptible to change. It is, in a sense, unstable. Punching this door with your fist, would easily close it, as the energy would start the door moving quickly. On the other hand, a slow steady push, would probably not close the door all the way, unless carried through to complete closure. Now lets take a heavy, solid door, maybe a steel fire door, or a good solid entry door. Such a door would have quite a bit of inertia, and so in a sense it would be stable, less amenable to change, than the lighter door. Punching such a door would get you a sore hand, but would probably not move the door very much. A slow steady push, though, would start the door moving, and would impart enough energy that the door's own inertia would complete closure. A bullet, fired at either door, would likely have more energy, than either a punch, or a push; but it would pass right through the door without closing it. 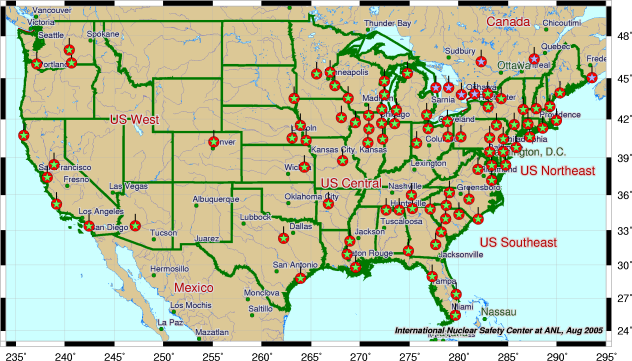 There are presently 103 functional nuclear reactors in the United States, though not all are for production of electricity. They produce around 20% of all of our electricity. They are getting old, but even with this, and with the incredible amount of regulation burdening the industry, they are still viable, and profitable. A comparison of the fueling procedures gives a pretty good indication as to why. Coal operated power plants always have rail spurs, and sometimes rail yards running through their property. This is a requirement, because of their huge appetites for coal. A twenty ton coal car will fuel a 1000 mw coal plant for twenty minutes - that's right, they use a ton a minute. What this means is, that a full train, carrying 110 coal cars, needs to arrive on site every few days, depending upon how close to capacity the plant is running. For each ton of coal burned, three tons of carbon dioxide will go into the air, as well as assorted soot, and other chemicals. In addition, massive amounts of coal tar, sulfur sludge, and other noxious solids will be left in the furnace, requiring constant removal to land fills. By comparison, a nuclear plant only needs to be completely refueled every six years. This is generally done in stages, with a third of the reactor core being replaced every two years. This is done by semi trucks, rather than by the train load, and creates no pollution, and requires no coal yard, or rail yard. The expended fuel rods sit in a little pool to cool down, before being taken to Yucca Mountain. For those who worry about nuclear waste, they should consider that the amounts are trivial, when compared to what comes out of a coal fired plant. How trivial? Well consider the numbers given at the top of the section. Recall that about two ounces of material must fission to provide 1,160 mw hours. This is the same amount of electricity that would require the burning of over sixty tons of coal. Sixty tons vs. two ounces. Recall also that the burning of a single ton of coal produces 3 tons of carbon dioxide, as well as roughly 650 pounds of solids and sludge. In addition, many toxic compounds, including mercury compounds, are found in coal ash. Most interesting of all, and ironic, is that the average 1000 mw coal fired plant releases 5.2 tons of uranium (containing 74 pounds of uranium-235) and 12.8 tons of thorium, as waste, because these elements are found in coal as impurities. This is about the same amount of nuclear material that is used as fuel, by a nuclear power plant of the same size (about 20 tons). So, amazingly, coal plants produce nearly the same amount of residue, as nuclear plants, only in the case of the coal plant, this residue is completely released into the air, soil, and surroundings. Think of this as fallout. A coal plant could actually fuel a nuclear plant, and we might be better off extracting fissionables from coal, to be used in nuclear plants, than burning it directly. As far as radiation exposure, population exposure from operation of 1000-MWe power plants amounts to 490 person-rem/year for coal plants and 4.8 person-rem/year for nuclear plants. That's right, people living near coal powered plants are exposed to roughly 100 times the radiation, of those living near nuclear plants. The nuclear comparison would be even better, except for the constant interference, and hamstringing of the anti nuclear groups. They could be vastly improved, through the use of fast reactors, which have been effectively banned by the anti nuclear forces. How much better, is indicated in the next section. The existence of slow, moderated reactors implies the possibility of fast un-moderated reactors. These do indeed exist. They are far more efficient than moderated reactors, and are, in their own way, quite simple. Fast reactors work the way that most people think reactors work. Neutrons collide with atomic nuclei and smash them apart. There is one limitation to these reactors, however. Think for a moment about the moderated reactors. A heavy water moderated reactor, can burn regular uranium, because heavy water is a great moderator. A light water reactor needs slightly enriched uranium (at least 3% U235), because light water is not quite so good a moderator. Logically then, a reactor which uses no moderator at all, would need to have significantly enriched uranium, and this is the case. Where the light water reactor can use 3% enriched uranium, the so called reactor grade uranium, the fast reactor needs uranium enriched up to about 90%, the ominously labeled, weapons grade uranium. In addition to being more expensive, and more difficult to create, weapons grade uranium can be made into atomic bombs, if stolen by an aspiring nuclear power or terrorist group. Reactor grade uranium, at 3% concentration, simply can not be made to into a bomb. Even with these concerns, there are enough advantages to this type of reactor, to have created an enthusiastic advocacy. The biggest advantage is that the fast reactor operates at 90% efficiency, as opposed to the 3% efficiency of the moderated reactor. Other advantages are that the waste leaving a fast reactor is considerably less radioactive, and less long lived, than that from a moderated reactor. A type of fast reactor using fertile and fissile materials has been labeled as a breeder reactor, because it can transform the fertile materials into more fuel than is burned in the operation of the reactor itself. The first reactors were moderated, because there was no plutonium, and no facilities for enriching uranium. They were graphite moderated, because heavy water is exceptionally difficult to make, particularly in the quantities required for the operation of a nuclear reactor. Eventually, the production of enriched uranium permitted the use of light water moderated reactors. As progress continued to be made, weapons grade uranium, enriched to 90%, and plutonium made possible the use of un-moderated, or fast reactors. As an interesting aside, heavy water is very nearly the ideal moderator. It does not absorb neutrons, as light water does, and requires no special enrichment of the fuel. Graphite is just as good; but has a tendency to catch fire, and can be very dangerous. During WWII, the Germans attempted to make a graphite moderated reactor; but failed, due to boron contamination of their graphite. Their scientists never realized what had happened, and drew the incorrect conclusion that a graphite moderated reactor could not be made to work. They thus spent the rest of the war attempting to create a heavy water reactor; but never did accumulate enough heavy water to begin construction. In America, a way was found to produce pure graphite without boron contamination. Boron is a potent neutron poison. Fast reactors have the advantage of being so efficient, that nearly any fissionable can be burned in them. This makes them quite useful, as a potential means of disposal of fissionable nuclear waste, and is one of the reasons that the radioactive waste produced by such reactors is so much less long lived. So in addition to being far more efficient than moderated reactors, fast reactors are the solution to the problem of nuclear waste management. The latest fast reactor design is the IFR (Integral Fast Reactor), so called, because the entire power generation, purifying, and recycling process is accomplished within a sealed vessel. The IFR uses rods of Uranium metal, rather than the uranium oxide pellets used by today's standard moderated reactors. Ordinary, water cooled reactors use pellets of uranium oxide, because they do not deform as they heat. Regular uranium metal expands quite a bit as it heats up, and would split the jackets and casings of the reactor core, as it reached a high enough temperature to generate power. It would also quickly lose criticality, since criticality is a function of the density of the core material. The IFR has no such issues. The IFR is a development of the old breeder reactors, which were reaching their peak of development in the seventies, before being killed by then, pseudo president carter. These plants required that spent fuel be sent off site, for reprocessing, into new fuel. Quite a bit of plutonium is produced, and carter claimed that it might be vulnerable during transport. The IFR was designed as an answer to some of these concerns, as well as to some of the problems plaguing the common moderated reactor designs. The IFR is not water cooled (water is a moderator); but uses liquid sodium in the spaces between the fuel rods, as a coolant. This permits it to be operated at a much higher temperature, and lower pressure. 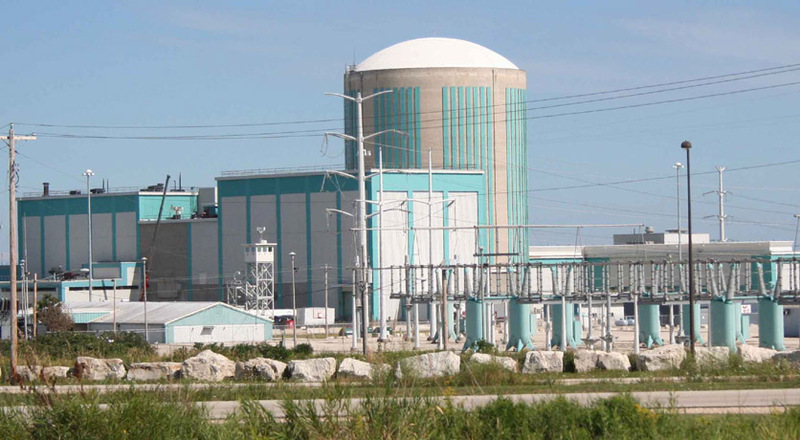 Because these reactors use metal uranium rods, if the reactor should ever get overheated, or the cooling system fails, the system will automatically shut down, due to the heat expansion of the rods, and their resulting lessening of density. It is a very nearly foolproof system. The proliferation concerns were addressed by having all processing done at the site - not only at the site, but in the same closed vessel which contains the reactor itself. This vessel was not only closed; but completely sealed and unmanned. In addition to the closed nature of the vessel, the whole vessel area is far too radioactive, during operation, for any human to survive. Thus, theft of nuclear materials is impossible. Though the IFR was designed to address proliferation concerns, and largely succeeded, executive branch buffoon, bill clinton, as well as presidential wannabe john kerry killed the IFR. These two demonstrated their vast ignorance, by claiming this was due to the very proliferation fears that this reactor design answered. One huge advantage of this reactor design, related to its vastly improved efficiency, is that nuclear waste from such a site, besides being produced in much smaller quantities, is only dangerous for around 200 years. This is in contrast to the waste being produced by the standard moderated rector, which will be dangerous for many thousands, of years. It may even be, that use of such reactors would permit the retrieval of our encapsulated nuclear waste, to be burned into more inert elements, while at the same time being used as fuel to produce energy. As an interesting aside, there is around 43,000 tons of nuclear waste in various locations. This sounds like quite a bit, and it is; but not as much as the numbers seem to indicate. these are very heavy elements, and the actual volume of the waste would be enough to fill a two story high school basketball court to the ceiling, or to fill a foot ball field to a depth of around five feet. This could be burned in fast reactors to the extent that, of the 43,000 tons existing, all would be burned up except for an amount of less than two tons. And that two tons would be dangerous for only a couple of hundred years, rather than the thousands of years of our currently produced nuclear waste. One of the big fears, and roadblocks to making proper use of nuclear power, is the fear of proliferation. For several years, the United States was the world's only nuclear power. Once the Soviet Union stole the methods of nuclear bomb making from the U.S., the Cold War began. For decades, the two so called superpowers glared at each other, and sought advantage for an anticipated nuclear showdown. One of the means by which each sought to gain an advantage over the other was by doling out nuclear weapons to their allies. Such a situation greatly complicated matters. The Soviet Union not only had to worry about a potential nuclear threat from the U.S.; but also from Britain, Germany, Australia, and even Israel. This was a nuclear proliferation of sorts, but is was a proliferation of trusted allies, or client states. Today, there is a real fear of random nuclear proliferation, of untrusted states, unstable states, or of terrorists. There are presently nine declared nuclear states, and two potential nuclear states. The Untied States, Russia, Britain, France, China, India, Pakistan, Israel, and possibly North Korea have nuclear weapons. South Africa had them for a while; but they were dismantled, and destroyed by the white minority government, before turning power over to the new black government. Iraq was developing nuclear weapons, before its occupation, and Iran is working on them right now. The most difficult part of making a nuclear bomb is purifying the raw materials, either uranium 235, or plutonium 239. Once this is accomplished, the reset of the job is, if not easy, at least not that difficult. As has been mentioned, the only source of Plutonium is a nuclear reactor. As has also been mentioned, the only way to purify or enrich the amount of U235 in a sample is through the very tedious and expensive separation by weight. Most smaller states do not have the capability of doing either. So the greatest perceived danger of proliferation is from states either stealing, or being made a gift of nuclear materials. the tradition means of battling proliferation was to keep very close tabs on any nuclear materials. Without access to these materials, and without the meant to make them, the non nuclear states were kept safely at bay. Sadly, this limitation may no longer exist, and proliferation may now be an issued that either has to be lived with, or interfered with by more active measures, than those traditionally used. Technology is more widespread than had once been the case. What had once been possible for only a few wealthy and technologically advanced states, is now openly available to many. Graphite moderated reactors, though dangerous, are easy to make. With today's new materials technology, pure graphite, uncontaminated with boron is available in quantity to whomever may wish to make use of it. Natural, unenriched uranium is not difficult to mine and process --- there is no need for enrichment if a graphite reactor is to be used. Once a state has an operating graphite reactor, it is simple enough to use it to breed plutonium from uranium 238. Where once procurement of nuclear materials was the key to developing a nuclear state, today it is only a shortcut. This makes the obsession with having no possible bomb making materials produced by power reactors, a bit silly. What the U.S. could do sixty years ago, most nations could do today, given a few years in which to work. The truth, which many in government do not wish to face, is that we can no longer sit idly by, and passively prevent proliferation by hamstringing our own nuclear capability. Active measures must be taken, or we must resign ourselves to living in a world in which the maniacal leaders of semi civilized countries have access to nuclear weapons. Well opinions vary; but the general consensus is that we can continue to use thermal reactors, burning U235, for 60 - 100 years, before running out. These reactors are only about 3% efficient, so there is a considerable amount of unburned fuel left in the "ash" that we cart off for burial in Yucca mountain, and other dump sites. AS a matter of fact, around 97% - 98% of what we dump there, could be recycled into fuel. Using fast reactors, which are 30 times more efficient, we are talking 1800 - 3000 years, and a chance to retrieve some of the 43,000 tons of nuclear waste, as use it as fuel. If you use breeder reactors, allowing us to utilize the very abundant U238, the numbers become almost incalculable. As U238 is around 150 times more abundant that U235 (0.7204% of naturally occurring uranium is uranium-235), you can figure anywhere from 27,000 to 45,000 years worth of fuel exist. If this is not enough, then we can look to thorium. Thorium exists in triple the quantity of uranium, so we can figure at least 100,000 years worth of nuclear fuels exist, for use at today's level of technology. Another thing to consider, when looking at the above numbers, is that they are all based on today's nuclear, mining, and refining technologies. There are vast supplies of all of these elements, which we are presently unable to make use of, due to the limits of our technology. Some estimates of the actual reserves of nuclear materials in the Earth, run into the billions of years, but assume improved technologies. Still, it is not unreasonable to expect that within 100, 000 years, we will come up with something better than what we have today. In point of fact, with a new 100, 000 year lease on our high energy based civilization, imagine what progress might be made. Fusion power is on the horizon, which will allow us to run nuclear reactors on water derived hydrogen, and make the previous fuel estimates moot. Such reactors are envisioned to run an entire city on the equivalent of a bucket of water. Given the time that the abundance of nuclear fuel on Earth buys us, it seems likely that direct conversion may even be discovered. So taking into consideration the facts above, I again have to ask: why are we burning food for fuel, why are we subjecting parts of our country to periodic brownouts, and power rationing, and why are we allowing ourselves to be constantly held up by the uncivilized inhabitants of the Middle East, who hate us? Virtually unlimited energy is the key to progress, civilization, and a high standard of living. It is also the key to spreading the benefits of civilization to the entire world. We exist in an energy economy. Economists talk about supply and demand; but ultimately, the cost of everything hinges upon how much energy is required for its production. Even the basic materials, the metals, woods, and plastics of which everything is built, are priced according to the effort, and energy expended to find, and then produce or exploit them. Cheap and abundant energy is the key to cheap and abundant material goods. It is also the key to a truly egalitarian society. Breeder various None 100,000 years or more extreme proliferation concerns. One kilogram is equivalent to about 22 million kilowatt hours of heat energy. The complete detonation of a kilogram of plutonium produces an explosion equal to about 20,000 tons of chemical explosive.